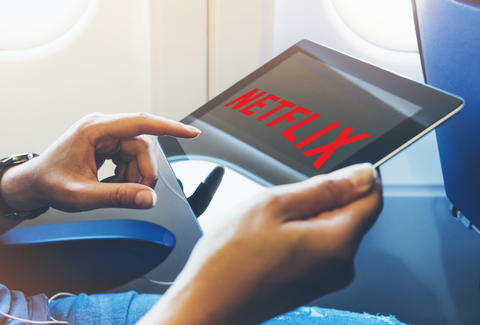 In-flight entertainment might be clogged by an array of movies that silently went to DVD with little fanfare, but the cinematic wasteland onboard commercial flights might be a thing of the past by next year, thanks to Netflix. The streaming giant wants to make its slate of programming a staple on airplanes by giving carriers access to its mobile-friendly, device-encoding technology. That way, you can binge on Stranger Things at high-altitude instead of subjecting yourself to the brain-rotting torture of Boss Baby. Part of Netflix's pitch hinges on the low-bandwidth of its mobile streaming capabilities. Decent Wi-Fi comes at a premium at 30,000 feet, but the company thinks carriers can look forward to saving 75% on bandwidth costs by partnering with Netflix, according to Variety. The result, Netflix says, will bring "DVD-quality" video to commercial airways by early 2018. Last year, Netflix made itself somewhat easier to access on planes with the advent of offline viewing. But while Netflix still offers a plethora of content for download, that option isn't quite the same as rummaging through the site's vast inventory of offerings in real time. Netflix has been trying to revamp the airline industry's languid entertainment technology for quite a while. In 2015, the company partnered with Virgin America to supply free Wi-Fi onboard select flights, and similar deals have been inked in the last two years with other carriers, including Aeromexico, Qantas, and Virgin Australia. Until now, those partnerships have provided your best chance to watch Netflix on a plane equipped with a strong enough Wi-Fi connection. To broaden its horizons, though, Netflix wants to offer stronger Wi-Fi on more planes, enabling passengers to stream their favorite shows without the frequent interruptions you're probably used to. Even if you're not a Netflix member, the in-flight amenity would allow you to sign up for a trial, so anyone onboard can stream until their heart is content. Netflix says its gambit ultimately aims to improve customer satisfaction by ensuring high-quality Wi-Fi onboard all flights. It's a smart business proposition, given that some carriers recognize the necessity too, and are starting to offer free text messaging to customers while they barrel through the ether. And it's hard to argue against Netflix's plans, especially when there's so much on the platform to stream -- and when you've got several hours to kill.